Dogs are our best friends. They give us love, joy, happiness, and comfort in times of need and change our lives for the better. And just like dogs change our lives, we can change theirs, too. January 24th is National Change A Pet’s Life Day. In honor of the day, here are ten heartwarming rescue videos that might make you tear up, but don’t worry because they all have happy endings. Hopefully these will inspire you to consider changing a dog’s life by adopting from a shelter. Not only will it change a dog’s life for the better, your life will change for the better, too! Happy National Change A Pet’s Life Day! Rusty Diamond was chained up to a fence outside for at least ten years by his abusive owners. It didn’t help that the temperatures in Arizona can get up to one hundred degrees in the summer, causing even more stress and pain for this dog. A neighbor took notice and began bringing the dog food and water through the fence every week. Eventually the owner handed the dog over to the neighbor who was able to give Rusty a whole new life. Most importantly, Rusty was finally freed from the fence and able to live her life as a true dog. These puppies were rescued from an illegal puppy mill in Georgia that had been operating since the 1980s. The owners were sentenced to 25 years of probation and pleaded guilty to 25 charges of animal cruelty. 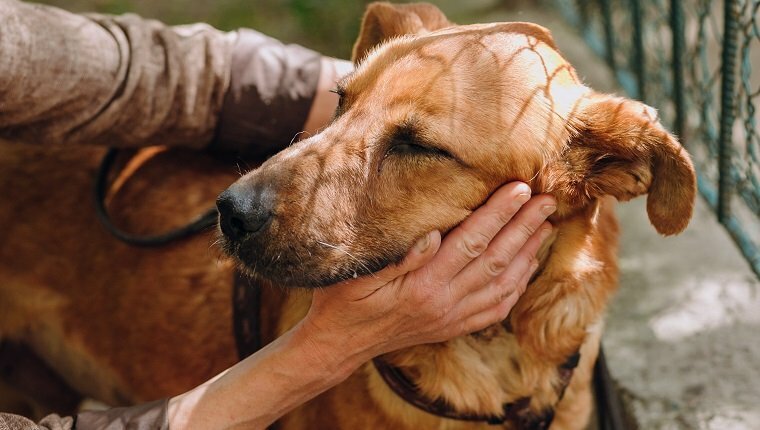 Luckily all the dogs were rescued and taken to the county shelter where they were fed, groomed, and given love and affection–something these dogs had been missing out on. Six weeks later, the puppies went up for adoption and found loving homes. One year after that, the people who adopted the dogs got back together for a heartwarming reunion. After eleven months of living under a dumpster by himself, this pup was finally rescued. He was scared, dirty, hungry, and needed help. After a call to the organization Hope For Paws, Cowboy was slowly coaxed out from under the dumpster. He was nervous at first, but they were eventually able to get him out and save him from the streets. After a good bath and big meal, he turned out to be a very happy, friendly dog. Cowboy was thankfully adopted by a loving family and now has a forever home. Sonya had been living on the streets in front of an office building. The owner said he had seen her there for the last ten years at least. She had been there so long that Sonya’s image even showed up on Google Street View when you searched the office’s address online. Hope For Paws eventually got the call from a good Samaritan who had been feeding her. They rescued her and Sonya was groomed, given arthritis pills, and her teeth were all fixed. She was turned into a brand new dog and hasn’t stopped smiling since. When rescuers from the Trio Animal Foundation found Ellen the dog in a Chicago animal shelter, she was in rough shape. Her fur was so matted that they couldn’t tell if she was a boy or girl dog. They even had to hold out a treat to find out which side was her face. It took an hour and a half to groom and shave the two pounds of extra fur–quite a lot for an eight-and-a-half-pound pooch. The fur in her ears alone was over two inches long. Ellen sat patiently and knew she was getting help from her rescuers. At the end of it all, she looked like a completely different dog and was ready for adoption! In India, this three month old stray puppy accidentally got stuck in tar being used to repair a road. She was completely unable to move her legs and free herself from the tar, and covered head to toe. Thankfully, a boy spotted her, and the group Animal Aid to came to her rescue. They used vegetable oil to help remove the tar and, finally, after four different baths, she was all better. This puppy was definitely happy to be clean and couldn’t stop giving love to her rescuers. Buzu was living in a cardboard box on the streets by himself. He had a skin condition, fleas, and fur missing all over his body. He had no microchip so they had no idea if he ever had an owner to begin with. This dog went from being too scared to come out of his cardboard box to playing with other dogs at the Howl Of A Dog rescue site. Since his rescue, Buzu was adopted in February of 2015 to a loving family in England. His new mom is an animal lover who especially loves dogs. Buzu went from a cardboard box to a happy home. When rescuers first arrived on sight, they realized quickly that Fiona was blind. Fiona was frozen with fear and would not move. Eventually after they were able to get her to come, they took her home and gave her a long overdue bath and shave. The vet said that while she was almost 100% blind, they could still save some vision in one eye. Now that she could see, Fiona turned into a very happy dog who could not stop wagging her tail. She now has a loving home thanks to owners Michele and Chris who graciously adopted her. This unique story begins with adventurers from Sweden who were on a 430-mile South American endurance mission. They gave Arthur the stray dog a meatball, and from then on he refused to leave their side. Even through the toughest trails which involved huge hikes, climbing mountains, trekking through the mud, and even kayaking through a lake, Arthur never left them. Lindnord, one of the trekkers, decided he could not leave his new friend behind, so he adopted him and after four months, he was able to get Arthur to his home in Sweden. T-Peg was discovered in Marion, Indiana on the side of the road in the freezing temperatures of winter. It was so cold that T-Peg had even gotten frostbite on one of his front paws. Thankfully, the vets were able to save him, but that meant having to amputate the frostbitten paw. The facility posted on Facebook about the ordeal in order to make people aware of the severity of leaving pets out in the winter temperatures. That post led T-Peg to his new owner, who saw the story and adopted him only one week later. There are lots of ways to change a dog’s life on National Change A Pet’s Life Day. You can share a homeless dog on your Facebook wall, donate old blankets, or visit a local animal shelter and give some love to a dog who needs it. What have you done to change a dog’s life? What has a dog done to change your life? Let us know in the comments below and spread the word about National Change A Pet’s Life Day!